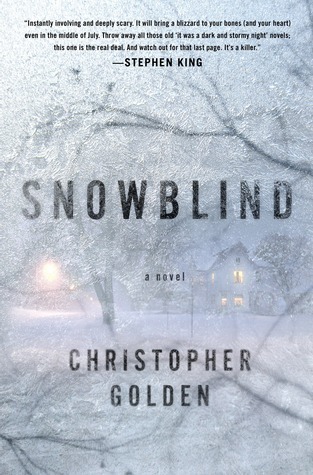 “Snowblind,” by Christopher Golden, is the type of story you do not want to read alone. Even if you read it in a room full of people, you will feel the bite of the bitter winter chill, and the menace that taints the blustery blizzard wind. This is a story of something mysterious, something waiting beyond your rattling door and frost covered windows. Something that can turn your nightmares to ice and freeze your screams in your throat. I’ll admit it–I’m not a fan of horror stories. However, I read this book because I was a fan of Christopher Golden’s other works, namely his Peter Octavian series. (Which isn’t really horror, as anything with vampires I consider to be Darn Fine Fiction.) And this book blew me away. Chris Golden creates characters I care about in this book, characters who are touched by the initial terrible blizzard and changed by it. Twelve years later, the blizzard returns, and these same characters are given a chance to confront their fears from the last storm, and perhaps, for some of them, they can face this new storm so as to change their own fates as they come to understand the fates of the ones they love. I highly recommend this book, especially if you like the works of Stephen King and Dean Koontz. Christopher Golden is a heck of a writer, and I hope that this book gains him the recognition his deserves. Advanced reading copy provided by Netgalley. “Snowblind” is available January 21, 2014.